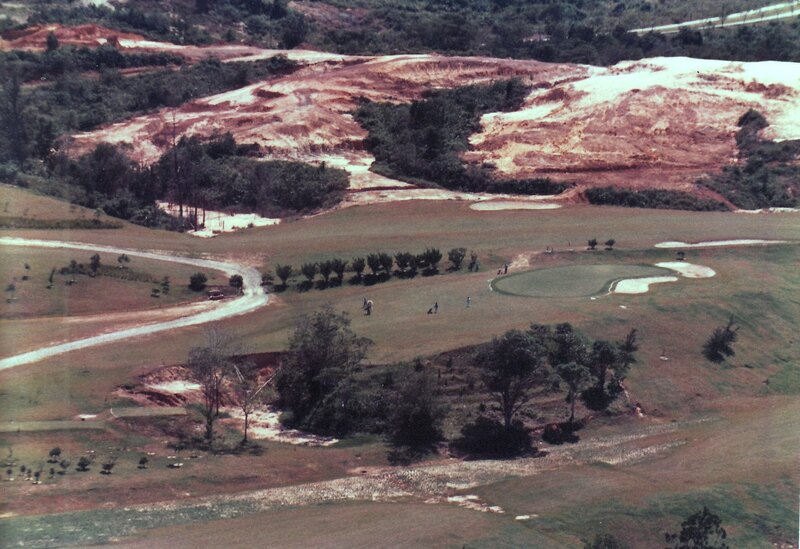 The view above was taken in 1988 when the course was partly open for play. In the background is seen clearing works for the first nine hole which is basically an inland route. 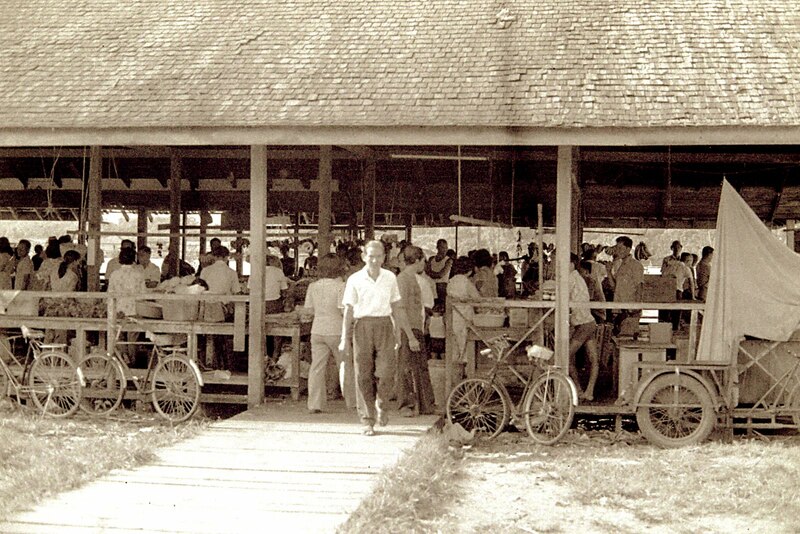 There is only one public golf course in Bintulu and is called the 'Bintulu Golf Course'. It exudes many scenic and attractive natural features that makes it a truly challenging and memorable course built to competition standards. It combines a links course ( back nine/second nine) and an inland course (front nine/first nine). I am in the mood to reminisce on my role in the development of the course in today's post. I was one of those lucky guys in town to have practical experience in developing this modern and international standard course. However a caveat is in place. The course was the result of a dedicated team of officers who saw the challenge of a lifetime to build a course for a booming Bintulu township of the eighties. Financially the course was sponsored by the BDA ( Bintulu Development Authority) a local statutory agency tasked with the planning, development and maintenance of Bintulu as a new industrial city for Sarawak. When on board the team in 1986, I was responsible for the turfing of the second nine course, landscaping and daily course maintenance. As was considered feasible at that time, it was decided to construct the second nine first due to its easier working terrain and fantastic views of the South China Sea. 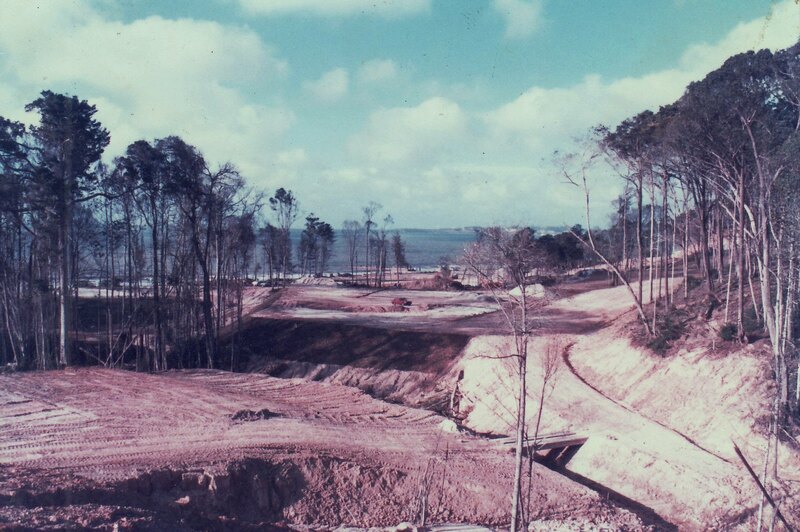 Thus an area of about 75 acres was selectively cleared, bulldozed and reserved for fairways, tees and greens etc., to follow a detailed plan developed by one of the JOVC ( Japanese Overseas Volunteers Corporation) volunteers attached to BDA by the name of Fumiaki Izumida. I could well remember how we preserved whatever stands of the " Tongkat Ali " for posterity during the jungle clearing operations. Before - intensive earthworks to Hole 12, with plenty of original vegetation preserved. 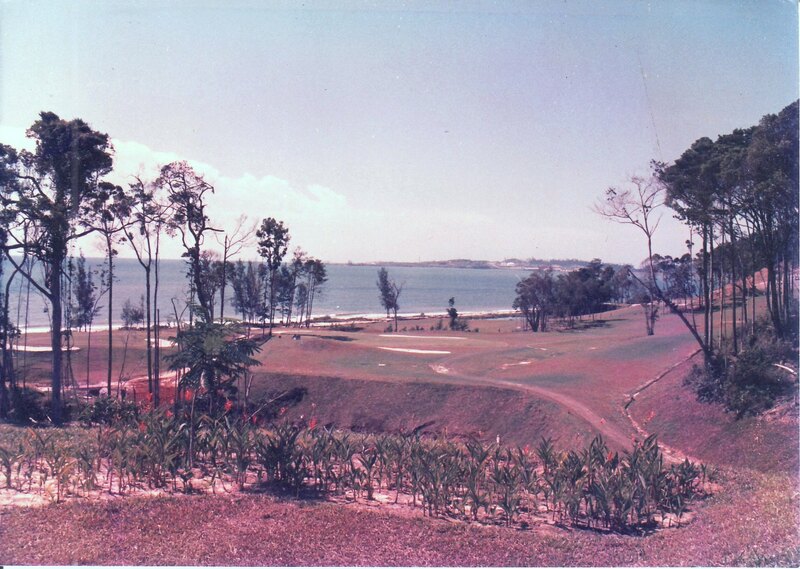 After - the turfing of fairways, slopes and greens done to Hole 12, with the South China Sea in the far background ( circa early 1988). The Hole 18 green planted with Tiff Dwarf grass. Note the fairways in the far background are not yet planted . I was totally in charge of the landscaping of the course which meant tree planting, turfing and its maintenance. For the greens I had to go to Sentosa Island Golf and Country Club in Singapore to bring in a half-kilo of Tifton Dwarf ( Tiff Dwarf) stolons ( scientific name : Cynodon dactylon and commonly known as Bermuda hybrid grass) which we propagated at our Sg. Plan Nursery and became the primal source of all the greens in the 9-hole course. For fairways and slopes the grass species used was Axonopus compressus or commonly referred to as 'Cow Grass' which was available locally in Bintulu and collected initially from Kampung Jepak village roads. 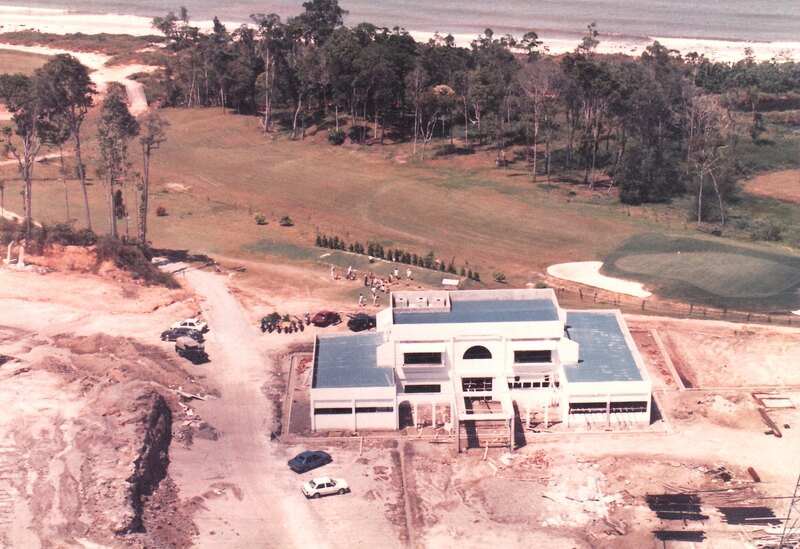 Bird's Eye View of the Clubhouse under construction with the Hole 18 Green fully turved in the background. For a start I was responsible to develop specifications for the cutting of the turves and many other daily maintenance works ( hollow tining, fertilisation, weeds and pests control, top dressing etc.,) . However after about 6 months later, the job was contracted out and the practice of contracting out the maintenance of the course continued for many years later. For the three full years of 1986-1988, my time was intensively engaged in one of the most memorable moments in my life as I had to learn fast on various subjects relating to golf course design and maintenance. All the tough work remains one of the adventurous chapters of my life. 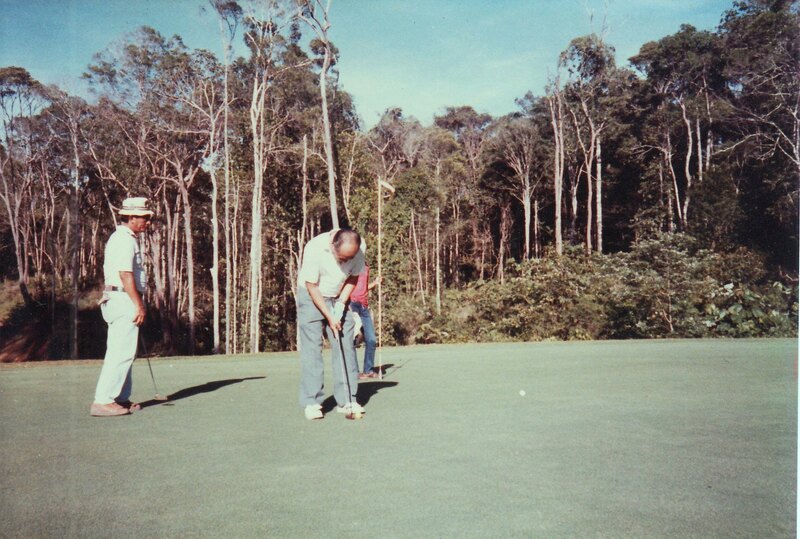 The course was officially opened for play in 1989 and having given some meaningful service to the Club, I was bestowed a " Life Member " of the Bintulu Golf Club. 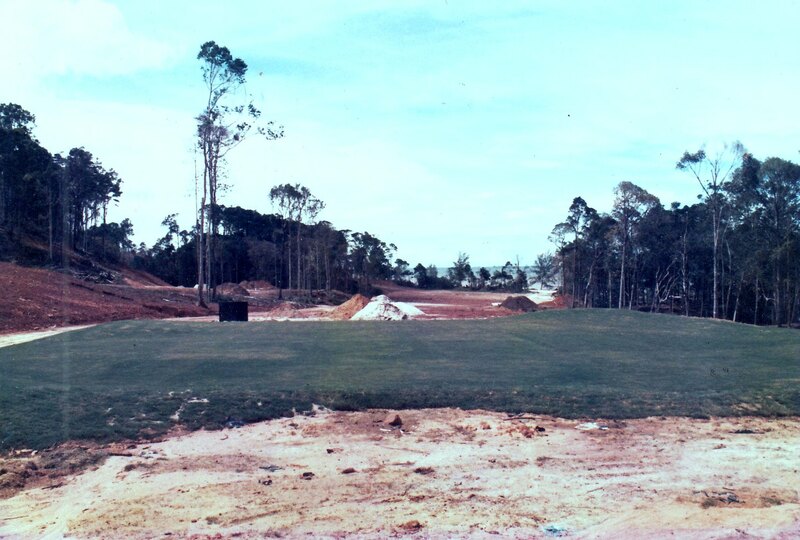 Now, 20 years later it surprises me why nobody or any other parties aren't scratching their heads to build another golf course for Bintulu.